Even if you've already had the flu this season, a shot can prevent you from getting sick again. As the flu epidemic rages on in many parts of the country, experts say the best defense against the virus is getting a seasonal flu shot. That's why it was particularly troubling that only about a third of people got vaccinated early in the season this year, according to a report by the Center for Disease Control and Prevention. 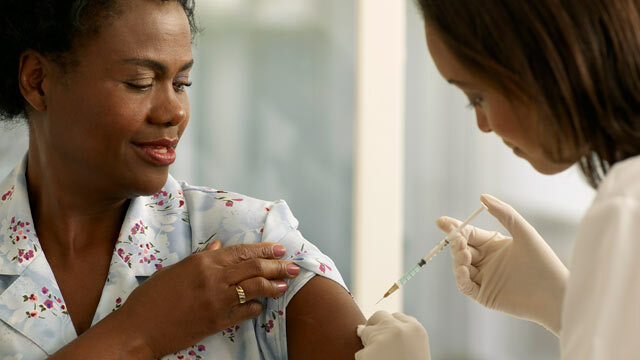 Dr. Richard Besser, ABC New's chief health and medical correspondent, held a tweet chat on Twitter today, in part to dispel the four biggest myths and misgivings people have about getting the flu vaccine. Medical experts from Boston Children's Hospital, The Mayo Clinic and the CDC also weighed in. Flu shots tend to be given at the time of year when respiratory viruses run rampant anyway, so it shouldn't come as surprise that some people catch a respiratory bug right around the same time they receive the vaccine. Also, because it takes about two weeks to build up immunity to the virus after receiving a shot, some people may get sick with the flu within that timeframe. The viruses contained in the flu shot are dead and can't give people the flu, according to experts at the CDC. The most common side effect from a shot is arm soreness, they tweeted. For children given the nasal spray form of flu immunization, the most common reactions are a runny nose, wheezing and headache. "Even if you've had the flu this year, get the vaccine. You are still susceptible to other strains of flu," he tweeted. Another mistaken belief: It's too late in the season to get a flu shot for it to do any good. Even though the flu epidemic has waned in many areas over the past week, Besser says the virus is prone to ebbs and flows and could still make a comeback. "Flu vaccines are like seat belts and air bags. They're imperfect, but the best protection against the flu we have," tweeted Dr. Greg Poland, head of the vaccine research group for the Mayo Clinic in Rochester, Minn. Recent CDC estimates found that those who got a shot of the 2012-13 vaccine were 62 percent less likely to get the flu and at far lower risk of requiring medical care if they did get sick. This is a common myth since current flu shots contain strains of the influenza virus grown in eggs. The experts on the chat noted that a reaction to the shot by someone with egg allergies is rare. "You should only avoid getting a flu shot if you have a severe allergy to eggs," tweeted Dr. Thomas Sandora, an infection control expert and epidemiologist at Boston Children's Hospital. A recent Journal of Allergy and Clinical Immunology study backs up this thinking. In the report, Canadian researchers followed 367 people with egg allergies who received a flu shot. None had a serious reaction to the shot, not even subjects with a history of developing anaphylaxis after eating eggs, and only 13 reported mild symptoms after the shot, such as hives or itchy skin. However, that's not to say it never happens, so if you are allergic to eggs, check in with your doctor before taking a seasonal flu shot. To raise public awareness about important health and medical topics, Besser hosts a one hour "tweet chat" most Tuesdays from 1 to 2 p.m. ET. Check the ABC News health page for more information. To participate, sign in to Twitter and click here for the hashtag. Follow the conversation or jump in with comments and questions of your own.